Over the past decade, two startling health statistics have captured widespread public attention: first, that all children born in the year 2000 face a one-in-three chance of developing diabetes during their lifetime; second, that nearly one-third of the US population is overweight or obese. Although both physical activity and nutrition are tied to this epidemic, new evidence from clinical and experimental research has pinpointed a role for disruption in the circadian system and sleep in obesity and diabetes. The internal circadian system can be thought of as an integrator of information that enables individuals to optimally time internal systems with the rising and setting of the sun. The primary research focus in our laboratory is to understand the molecular mechanisms through which the circadian clock regulates cell and organismal metabolism and the reciprocal feedback of metabolism on circadian oscillators in animals. Our long-range goal is to exploit insight into the clock to identify regulatory nodes within metabolic pathways important in beta cell biology, mitochondrial function, NAD+ biosynthesis, NAD+ dependent ADP-ribosylation and deacetylation reactions, and to determine the impact of these epigenetic modifications on proliferation and stress response. These studies will elucidate the relationship amongst brain, behavior, and physiology at both the cell and molecular level. We anticipate that a better understanding of clock processes will lead to innovative therapeutics for a spectrum of diseases including diabetes, obesity, autoimmunity, and cancer. Clock proteins comprise an autonomous and anticipatory molecular network, and our studies have uncovered a critical role of this system in information processing from the genome to whole organisms. Single cells exhibit oscillation, but how does this give rise to physiologic change in whole organisms, and how do environmental signals feedback to influence these cycles? Central questions that are addressed in our planned research include: How do clocks control gene transcription dictate physiologic outcomes relevant to insulin control by the pancreatic beta cell? And what are the ramifications of clock regulation of the central oxidoreductase and epigenetic cofactor NAD+ on SIRT enzyme activity important in stress response, redox homeostasis, glycolytic and oxidative fuel flux, and posttranslational modification of mitochondrial enzymes? Glucose homeostasis is a dynamic process subject to rhythmic variation throughout the light-dark cycle. Impaired glucose regulation arises from desynchrony of anabolic and catabolic hormones across the circadian cycle and leads to metabolic syndrome and diabetes mellitus, disorders that are associated with over-nutrition, sedentary lifestyle, and sleep-wake disruption common in industrialized society. Individuals with diabetes must adjust their insulin levels differently every day and night even independently of how much they eat, but the molecular underpinnings of circadian glucose regulation have been previously unknown. Against this backdrop, work from our laboratory first revealed an essential role of the intrinsic beta cell clock in insulin secretion, beta cell development, and diabetes mellitus (Nature, 2010). A major priority of our planned research is to dissect the genomic and physiologic mechanisms of the clock in beta cell failure. 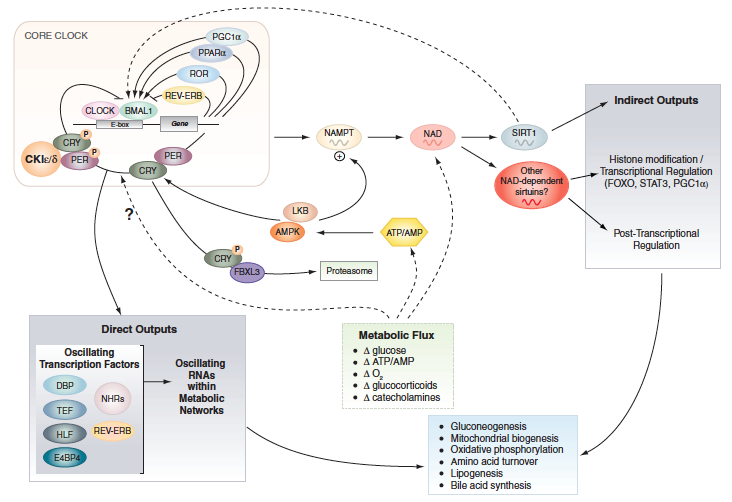 In 2009 we first reported discovery of a new node in the integration of circadian and metabolic systems involving feedback regulation of NAD+ biosynthesis (Science, 2009). NAD+ is a precursor of NADP+ and is required for macromolecule biosynthesis, in addition to functioning as an oxidoreductase carrier. NAD+ is also a required cofactor for the class III histone deacetylases (silencer of information regulators, SIRTs) that are nutrient-responsive epigenetic regulators. Biochemical analyses show that SIRT1, the ortholog of yeast Sir2, executes the deacetylation of substrate proteins generating O-acetyl-ADP-ribose and releasing nicotinamide, which is then regenerated through its salvage to NAD+ by the rate-limiting enzyme nicotinamide phosphoribosyl transferase (NAMPT). We originally showed that CLOCK/BMAL1 directly control the transcription of Nampt, and in turn generates rhythmic expression of NAD+ and the activity of SIRT1, which associates with CLOCK/BMAL1—identifying a feedback loop composed of CLOCK/BMAL1-NAMPT/SIRT1. More recently, we have identified a role for the clock-NAD+ pathway in mitochondrial respiration (Science, 2013), and our present efforts include the analysis of clock-NAD+ regulation of cellular redox, cell signaling, and epigenetic regulation, with the ultimate aim of applying such knowledge to studies of cell growth, proliferation, stress, and DNA damage response.